Ecuador and the Galapagos Islands may be one of the smallest countries in Latin America, but there are a number of absolute musts to include in any itinerary. 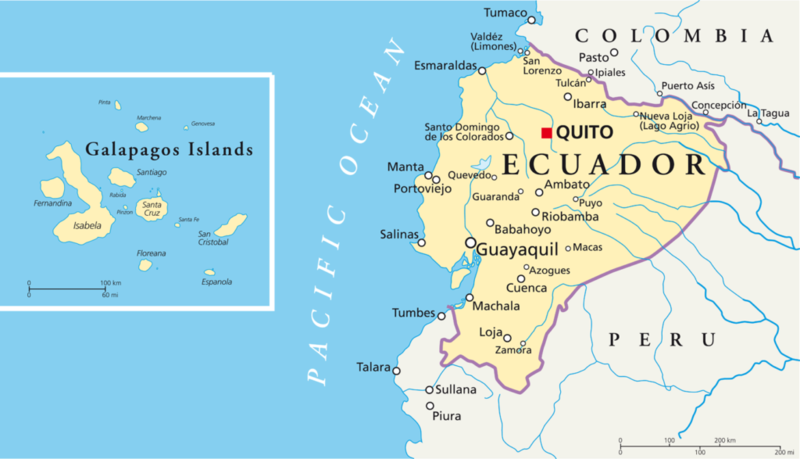 Quito, the capital, sits in the high central valley, between two cordilleras, or sub-ranges, of the Andes, that form the heartland of the country. Unsurprisingly Quito is set on a hillside with some impressive views including that of the the still-active Pichincha Volcano. The centre of the town consists of elegant 16th Century colonial buidings, and features the oldest church in Ecuador, the Monastery of San Francisco, while the modern, lively Avenida Amazonas provides plenty of cafes from which to watch the world go by. The central valley south of Quito, know as the ‘Avenue of the Volcanos’, is peppered with more than 30 volcanos; the largest concentration anywhere in the world. Most measure around 5,800m high and eight are active, including Cotopaxi, which at 5,913m is the highest active volcano in the world. The degree of activity is constantly monitored and studied, and, at times, areas may be closed or even evacuated – usually with some notice! Around Cotopaxi lies a national park with spectacular walks, isolated Indian villages and, if you are lucky, glimpses of condors and wild horses. For other national parks and reserves, consider visiting the coastal and marine park of Machalilla, which includes Isla de la Plata with its pre-Colombian ruins; the Sangay Wilderness Park, home to many rare species; and the Pasochoa Forest Reserve and Podocarpus National Park for incredible, varied flora. At the southern end of the central valley lies Cuenca – a town built by the Spanish on the site of the Inca town of Pumapungo, with many of the beautiful pink marble colonial buildings set on ancient Inca stone foundations. The city has a mild climate all year round and makes a good base for a pause in your itinerary and to explore Ingapirca, the most important Inca ruin in the country. A special mention must be given to the impressive train journeys of Ecuador and in particular the route from Alausi to Bucay. Starting high in the Andes in the pretty village of Alausi, the train descends to the coastal lowlands to the port of Guayaquil. Opened in 1908, this railway is a great feat of engineering, with the Devil’s Nose providing a hair-raising descent through a series of curves down a near-vertical cliff face – for the thrill seeker, an excellent vantage point is the carriage roof! The Galapagos Islands, often the main reason to visit Ecuador, need little introduction; a group of eighteen volcanic, harsh and isolated islands where species have evolved independently from the mainland and the rest of the world. Their famous inhabitants, such as marine iguanas and giant galapago, or tortoises, capture the limelight, but there are many other animals, birds and flora to enjoy, many unique to the island. All expeditions to the islands are conducted by boat with landfalls made under strict supervision of professional guides. It is a fascinating experience that will get you very close to some amazing wildlife; it is even possible to snorkel or dive with sea lions and penguins. A visit to Ecuador will introduce you to splendid scenery, an interesting indigenous culture and amazing wildlife. In addition to great memories, you are also likely to come away with some beautiful handicrafts that have been produced on the islands, their designs unchanged for centuries.